17 November 1775- The Continental Congress elected Henry Knox "Colonel of the Regiment of Artillery"
The Air Defense Artillery branch is the branch of the United States Army that specializes in anti-aircraft weapons (such as surface to air missiles). In the U.S. Army, these groups are composed of mainly air defense systems such as the Patriot Missile System, Terminal High Altitude Area Defense (THAAD), and the Avenger Air Defense system which fires the FIM-92 Stinger missile. The Air Defense Artillery branch descended from Anti-Aircraft Artillery (part of the U.S. Army Coast Artillery Corps until 1950, then part of the Artillery Branch) into a separate branch on 20 June 1968. On 1 December 1968, the ADA branch was authorized to wear modified Artillery insignia, crossed field guns with missile. The Branch Motto, "First To Fire", was adopted in 1986 by the attendees of the ADA Commanders' Conference at Fort Bliss. The motto refers to a speech given by General Jonathan Wainwright to veterans of the 200th Coast Artillery (Antiaircraft) stating they were the 'First to Fire' in World War II against the Empire of Japan. According to the Army's Field Manual 44-100, the mission of Air Defense Artillery is "to protect the force and selected geopolitical assets from aerial attack, missile attack, and surveillance." 1st AA Machine Gun Battalion through the 6th AA Machine Gun Battalion. These units were organized by Col. James A. Shipton and were demobilized January–May 1919. The National Defense Act of 1920 formally assigned the air defense mission to the Coast Artillery Corps, and 4 battalions were organized in 1921. In 1924, under a major reorganization of the Coast Artillery, the battalions were reorganized as regiments. There were also 42 Organized Reserve antiaircraft regiments in 8 brigades; however, many of the Reserve units only had a small number of personnel assigned, and many were demobilized without activation during World War II. 197th Coast Artillery (AA) N.H.
198th Coast Artillery (AA) DE. 200th Coast Artillery (AA) N.M.
202nd Coast Artillery (AA) IL. 203rd Coast Artillery (AA) MO. 206th Coast Artillery (AA) AR. 207th Coast Artillery (AA) N.Y.
211th Coast Artillery (AA) MA. 212th Coast Artillery (AA) N.Y.
213th Coast Artillery (AA) PA.
214th Coast Artillery (AA) GA.
251st Coast Artillery (AA) CA. 369th Coast Artillery (AA) N.Y. In 1938 there were only six Regular Army and thirteen National Guard regiments, but by 1941 this had been expanded to 37 total regiments. In November 1942, 781 battalions were authorized. However, this number was pared down to 331 battalions by the end of the war. By late 1944 the regiments had been broken up into battalions and 144 "Antiaircraft Artillery Groups" had been activated; some of these existed only briefly. On 9 March 1942 Antiaircraft Command was established in Washington D.C. and in 1944 the AAA school was moved to Fort Bliss. 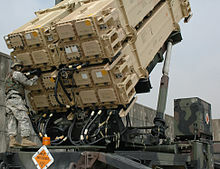 In 1991 the Patriot missile was heavily utilized during the Gulf War. After this short skirmish ended Air Defense has not been involved in any significant combat actions due to lack of enemy air assets and/or missile technology. In 2010 the United States Army Air Defense Artillery School was moved from Fort Bliss to Fort Sill. The following lists all units that make up the Army's Air Defense Artillery Branch. The Shipton Award is named for Brigadier General James A. Shipton, who is acknowledged as the Air Defense Artillery Branch's founding father. Shipton felt that the mission of antiaircraft defense was not to down enemy aircraft, but instead to protect maneuver forces on the ground: "The purpose of anti-aviation defense is to protect our own forces and establishments from hostile attack and observation from the air by keeping enemy aeroplanes [sic] at a distance." The Shipton Award recognizes an Air Defense Artillery professional for outstanding performance individual thought, innovation and contributions that results in significant contributions or enhances Air Defense Artillery's warfighting capabilities, morale, readiness and maintenance. ^ Biographical Register of the Officers and Graduates of the U.S. Military Academy at West Point, N.Y.
^ Bob MacDonald. "We Aim to Hit". California State Military Museum. California State Military Department. Retrieved 28 January 2012. ^ "Air Defense Artillery" (PDF). Fort Sill. US Army Fires Center of Excellence. Retrieved 6 November 2017. ^ "94th Army Air & Missile Defense Command". Archived from the original on 5 August 2012. Retrieved 13 February 2012. ^ Stiller, Jesse H. (2010). "ADA Branch: A Proud Heritage" (PDF). Air Defense Artillery Online. Archived from the original (PDF) on 29 July 2014. LTC Barnard and Berle K. Hufford, ARADCOM Annual Reports from 1966-1973. Morgan, Mark L.; Berhow, Mark A. (2010). Rings of Supersonic Steel: Air Defenses of the United States Army 1950-1979, 3rd Edition. Hole in the Head Press. ISBN 978-09761494-0-8.
http://www.ftmac.org/Lanike2.htm - 47th Brigade at Fort McArthur, Calif.